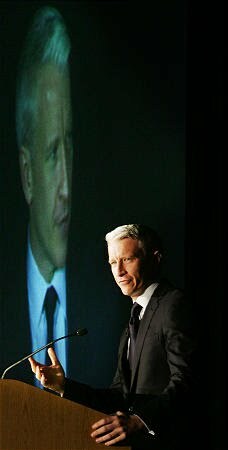 Anderson Cooper anchored AC360 live from London on Wednesday evening, or was it Thursday morning since he was in the UK? PromaxBDA announced Wednesday that Anderson Cooper will join the lineup of speakers at their annual 2011 Conference in New York from June 28th to the 30th. PromaxBDA is an international organization for entertainment marketing professionals. In addition to Anderson and keynote speaker Al Gore Jeff Zucker, former president and CEO of NBC is also on the roster of speakers. Here's CNN's schedule for overnight and the Royal Wedding on Friday morning. Programming for the entire day is listed on our sister blog All Things CNN. We'll be recording and posting clips of the Anderson and the CNN team's wedding coverage as quickly as possible throughout the night/day. Please be patient, there will be a lot to post and it may take us a while to get it all uploaded. If you're around and want to share your views on the wedding as it happens we'll be posting comments throughout the broadcast (if our alarm wakes us up as scheduled). Love your work.Someone asked me why I like Anderson so much? I think he is, despite his upbring a very down to earth, funny, charming person. Thank you for your hard work on this blog. These birthers are idiots. They got what they wanted, the POTUS long form birth certificate. They need to let it go but its apparent they're not going to. What more do they want? Now they just look like even bigger idiots than they already did. Loved Anderson talking to Richard Quest, Isha Sesay and Cat Deeley. Very amusing, especially Anderson being confused about British terminology. John King did a terric interview with Trump and really hit him hard, and you could tell Trump was annoyed and flustered. Well get used to it Donald, because if you want to be the Prez, they're going to hit you a lot harder than that. Terrible storms in the South and glad it was the lead story rather than the wedding. accused AC of "feeding into the birther frenzy." In a way he was right, but for the wrong reasons. It was Trump who was doing the birther feeding and the "media was just eating it up." It may have been the lighting but AC looked very tired on my screen. Too much flying through time zones can do that for sure. @anon 1:00 pm on the previous post, thanks for mentioning Whoopie's comments on The View--she's right, as much as people want to deny that what Trump's done has racial overtones, it clearly does. I was annoyed with Anderson asking Andy Card (who's as big a fool as Trump) whether he thought Trump was being racist--what did AC expect him to say? Of course the entire birther movement is racist, but Card had the twisted idea that it's somehow the President's fault for not showing the long form soon enough. Well, he didn't have to in the first place, the proof was already there with the short form, but they refused to accept that. Trump's now questioning Obama's educational background since his birther notions have been slapped down. In Trump's view, a black man couldn't POSSIBLY have the brains to get into Harvard. The very fact that Trump believed that the birther issue and the education issue could get traction and resonate is proof that he harbors racist views himself and it's time people stopped dancing around it. I didn't see all of John King's interview with Trump, but he did attempt to press him on his claims and he made some good points about Trump and his phony denials about ramping up the birther issue. The whole spectacle and the complete disrespect some have shown (including the media) to our President has been sickening to watch and probably unprecedented. It was a little odd for 360 to have some storm news at the start and then interrupt that to discuss Obama's newly released long-form birth certificate and then resume storm news later. I've never liked it when they chop up a news stories like that. I love Anderson but got to give first prize to best interview with a birther to Lawrence O'Donnell. His segment with Orly Taitz was phenomenal. He wouldn't put up with her craziness and stopped the satellite interview. He then told us "She's crazy. I invited a crazy person on the show." The last part of 360 with the royal discussion was fun. Don't quite understand why Cat Deeley is there but she has a good sense of humor. Hope Anderson gets a good night's sleep. He looked tired. @aries moon: You are absolutely right....every word. Sooo looking forward to the coverage! I must admit that can't wait to see Kate's "frock"! @Judy--I'm so tired and irritated with all the transparent nonsense directed at the POTUS. Yes, Lawrence O'Donnell was on fire last night with Taitz, it was pretty amazing.